for flash disk operation, connect to SI and SO of external flash. for flash disk operation, connect to CLK of external flash, also connect to 5.1K pull-up resistor to VCC (3.3V). for flash disk operation, connect to CS of external flash. 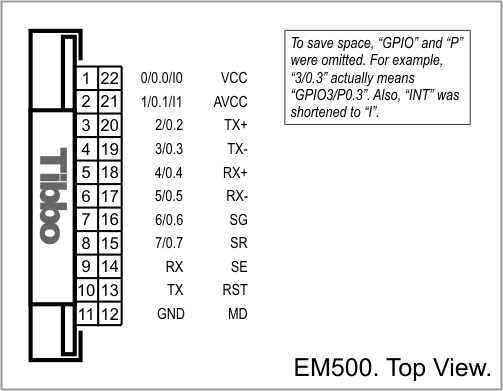 for Wi-Fi operation, connect to DI and DO of GA1000. for Wi-Fi operation, connect to CLK of GA1000, also to reset-generating logic (NAND gates). for Wi-Fi operation, connect to CS of GA1000, also to reset-generating logic (NAND gates). RX, W1, and din input of the serial port. TX, W1, and dout output of the serial port. Reset input, active low. Proper external reset is a must. Link status LED control line. Dual-function red status LED control line. Dual-function green status LED control line. "Clean" power output for magnetics circuitry. Positive power input, 3.3V nominal, +/- 5%, max. current consumption 260mA.